Before the Halloween Midterm Break, the TY students experienced an RSE talk hosted by the organisation ACCORD. Group work was also used to help each other describe scenarios where family breakdown might happen, etc. This lecture benefited us as young adults in terms of being ready to be in another persons life, do's and dont's of peer pressure and how we can avoid it, by being around good friends. This lecture would be highly recommended to the TY students next year because of the educational aspect to it. Book Launch - "Learning for a just World"
On Wednesday the 25th of October, three lucky students, who were chosen by Ms. Grace, ventured out into the city to attend the launch of a fantastic new resource for Development Education. We took the train into Pearse station and after a quick stop in Off Beat Donuts (thanks to Ms. Grace) we started walking into the city. The event took place in Loreto College, St. Stephan’s Green and was attended by some very important people including Éamonn Meehan, the executive director of Trócaire and Ciarán Cannon, The Minister of State for the Diaspora and International Development. The new resource is called “Learning for a Just World”. The resource is the product of hard work and dedication on the part of Trócaire, The Loreto Education Office and Irish Aid. 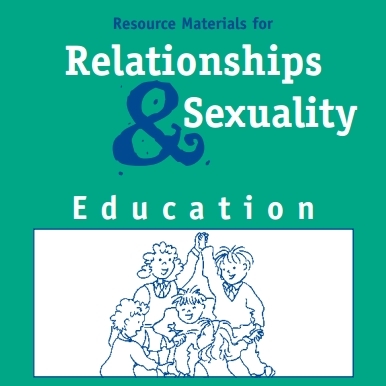 The book was made with the intention of incorporating it into the New Junior Cycle and educating girls about the world around them. The event consisted of some speeches from the people who developed this resource, a presentation from some girls from Loreto Navan on their school Social Justice group and then we were treated to some tea, coffee and pastries. It was a wonderful experience to represent the school at such an important event and we were very honoured to be there. The 18th October was the first day for the Jigsaw Peer Education Program. This program was attended by six lucky TY students along with students from Skerries Community College and Coláiste Ghlor na Mara. We all met with Ms. Costigan that morning feeling excited but nervous at the same time. We hopped on the bus and arrived in Coláiste Ghlor na Mara to meet with the students from the other schools. While we were walking up to the school our eyes started drifting showing us the glimpse of the brand new school we were just about to enter. After introducing ourselves in a unique fun way, Aoife and David (presenters and organisers of the program) went through the slideshow presentation explaining all about the basic grasp of mental health and what exactly is mental health. We later ended the program with a debate on weather we agree or disagree that "Young people are better off talking about their mental health to people their own age rather than to adults". Thinking we would hardly get anything covered from 9:30 am to 12:30 am was something we got wrong, we covered a lot within those 3 hours and we enjoyed meeting with new people. It was something that we all haven't tried before and it was a great experience. We were all looking forward to the next program. On the 24th of October, we set out on the small minibus driven by David that would take us to our desired desination -Coláiste Ghlor Na Mara in which our second Jigsaw session took place.We were all glad to see all of the other students as we had a great encounter with them during the first training session.This time Ms McKenna accompanied us to the session and kindly brought in sweet treats such as biscuits and muffins that we all shared with each other during our break. As we began the session we talked about the topics we had covered in the last session.We then played an interactive game in which we all stood in a circle and guessed each others names.We would each say our name and call out the name of the person we would pass the ball to.It was quite funny when we had to quickly pass the ball while simultaneously saying each others name which greatly tested our memories.By the end of the game we could all confidently say we knew each others names. We then moved on to a walking debate in which we were given statements such as "It is the fault of the parents if their young child is suffering with mental health problems".Upon hearing these statements we would walk to the side of the room which said agree or to the side that said disagree. If we were not sure we would stay in the middle.We then voiced our opinions and reasons for agreeing,disagreeing or not being sure. After this we went into detail of each piece of the presentation so we would gain a better understanding of mental health and the positive message behind the importance of good mental health. Lastly we all brought out our props in which we would use to explain our various interests and hobbies and why they made us feel good. Many brought in books,sketch pads,note books ,scout badges,footballs and many more to present to the group.We all stood in front of each other and were given one minute to do our mini presentation.Although it seemed nerve racking at first, it was a great way to learn about each others talents and hobbies.It also improved our public speaking. Once again after the fun packed three hour session, we said our goodbyes (and sláns to the Irish speaking staff at the reception) and headed straight to school just in time for lunch. Today was the third session of the peer education program organised by Jigsaw. We met with Ms. Ferris at 9:10 in the atrium for rollcall. Then we hopped on the bus with David along with the other students from Skerries Community College. This was our third session so we were getting used to to the place and becoming more comfortable with the people there. We sat down on our chairs and David and Aoife started the program with the third section of the mental health slideshow presentation. We did an activity within our school groups regarding raising mental health awareness through the app Twitter. We had to come up with a slogan and a few hashtags and the limited characters were 140. After presenting it to the other school groups we got in a circle and discussed mental health issues such as bullying, teenage relationships, anxiety and panic attacks. We discussed people to go when dealing with these particular issues. We then took a break which was everyone's favourite part of the time. We served ourselves tea, chocolate biscuits, and some Jaffa cakes. We joked around and got to know the each other even more. After the short break we were put into groups and we were giving giving another activity task. This times activity task was to discuss " why young people find it hard to talk about their mental health " . Instead of discussing and presenting this in a normal way we presented it in news format along with the news background sound effects. We later on discussed one adult figures that we know in our lives, in anyone's lives, in TV shows, in movies or social media's. Movies: In the lion king Mufasa and Simba, in Moana Moana herself and her grandma, the fairy godmother in Cinderella. After saying goodbye to everyone we headed our way back to school back to our last class. On the 14th of November, we met at 9:10 at the foyer. We were all slightly nervous as this would be the first Jigsaw training session that we had to present the presentation entitled "Its Time To Start Talking" in front of each other. As I took many sips of water to calm my nerves, the Jigsaw Peer Education staff, David and Aoife suggested we start our 4th session with an ice breaker. We played the game "Fruit Salad" in which we were all given the name of a fruit. One person would call out a fruit e.g. orange. All the oranges would then get off their seats and quickly rush to another seat before they were all taken.The person left with no seat would call out another fruit and so on.The ice breaker calmed down my nerves as I was quite awake and adrenaline boosted afterwards. We then had our ten minute break.Of course we were once again supplied with the usual tasty treats of chocolate biscuits, muffins,tea and coffee. Mmmm! Aoife and David were the first ones to do the presentation to quickly remind us of how it is done before we students did it. I was extremely grateful for this as it was a good guide to how I would present the slides.When they were done it was time for us to begin the presentation. We were each given a sheet in which we would constructively criticize each others performance.We all went up and even though some of us were quite nervous at first, we all did a particularly impressive job. I was certainly happy with my performance and figured it wasn't as bad I thought it would be.That was quite a relief! After everyone had went up, we all pointed out each others strengths and things we could work on from the presentation.We truly learned a lot from this session and found ways that we could improve our public speaking skills.It was the best way to learn from our mistakes and to hopefully deliver these talks with no difficulties to our peers in school. Once the session was over we said our goodbyes and left with our heads high feeling proud of ourselves and each other. On Friday the 27th of October, while most students prepared for their mid term, a group of History and German students, including many 4th years met at Dublin airport at 4.30am for their very early flight to Berlin. Many of us seemed a little cranky queueing up for security but we seemed in a much better form after we had a good nap on the plane. We got through the airport in Dublin and Berlin surprisingly fast, although I did get searched by a security guard after setting off their security machine. We got a coach to our hotel and barely had time to abandon our bags in the hotel basement. 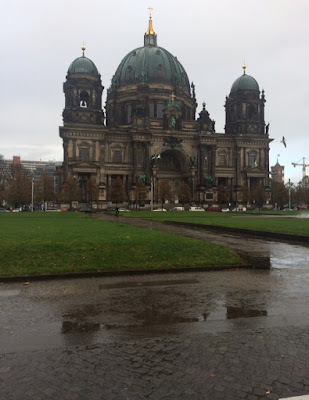 Then it was off to our first trip, a walking tour of Berlin city. While many of us weren't exactly keen to walk around the city in the lashing rain we actually had an amazing time. We got to see some of Berlin's most interesting landmarks and learn about its rich history. 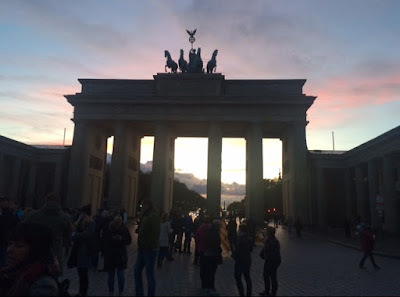 We saw landmarks like the Berlin Wall, Hitler's bunker, and the Brandenburg Gate and got background about them from our helpful tour guide. 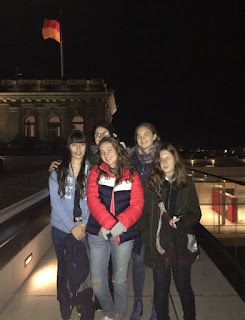 After the door, we went back to the hotel to explore our rooms and have dinner, then we headed off to the Reichstag building, the German parliament. We went through a quick security check there, where of course I managed to set off the security machines again and get another pat down. Once we got through we were given a headset with earphones to guide us through the parliament. The building had fantastic architectural features and the view from the top of it of Berlin at night was breath-taking. The glass dome on top of the building which represented the reunification of Germany was especially impressive as it used the sunlight to decrease the carbon emissions of the building. 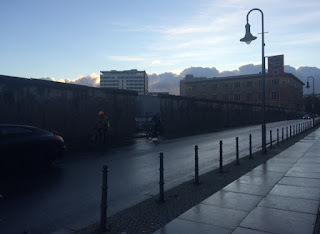 On the Saturday we visited Checkpoint Charlie and the Topography of Terror. Checkpoint Charlie was a crossing between the capitalist and communist sides of Germany before the fall of the Berlin Wall. There is a large mast in the middle of the checkpoint which symbolically features a picture of a Soviet soldier on one side looking over the American sector and an American soldier on the other side looking over the Soviet sector. We had a chance to get our picture taken with a soldier outside of a replica of the guard house that stood there. We went to the museum there which featured plenty of interesting images, newspaper articles, and stories of the point and how people attempted to escape over the border. After that, we visited the Topography of Terror, a holocaust museum. A guide showed us different parts of the museum and explained some of the images we saw. The experience was informative but sombre, and opened our eyes to the horrors of Germany's past. That afternoon we went to Alexanderplatz, a huge square in Berlin for lunch and shopping. Some 4th years decided to sample the local cuisine and try Currywurst. Currywurst, by the way, is sausage sliced up and covered in ketchup then sprinkled with curry powder. It was about as tasty as it sounds, I later decided to buy a pretzel to expel the taste from my mouth. We shopped in some of the major shopping centres in Alexanderplatz and people bought designer tracksuits and delicious German chocolate for their families. I got a snow globe which later broke. That night we went to see 'The One Show' which I could only really describe as a spectacle. It was an artistic show, meaning it didn't have any main plot and featured beautiful and strange costumes as well as well as dances with fire and gymnastics and singing. We later asked the teachers what the entire thing meant, but were told that it was probably better not to overanalyse it. Nevertheless, it was certainly very entertaining and captivating. Things only got more confusing as our bus driver sang us German shanties over the speakers on our way back to the hotel, but overall we had a fantastic day. On the third day we got a coach to Potsdam and were brought to Cecelienhof Palace. Unfortunately, we never actually got to do our planned guided tour of the place as it was shut until 12pm on Sundays. However we did get to admire the majestic outside of it while it was redecided what we could do for the morning. We eventually ended up going to a nearby village which was an unexpected and very beautiful place. Some 4th years decided to skip the Currywurst that day and we headed to a nice Italian restaurant for lunch. Others visited the amazing bakeries and cafés in the village. After the village, we went on to the Wannsee Conference House. We learned that at the Wannsee Conference, many Nazi figures including Adolf Eichmann discussed the solution that had been reached about how to deal with the Jewish people in Europe. Our tour guide gave us a very engaging talk about the conference and answered some insightful questions very well. We were given a chance to walk around the house after that and read or listen to stories about those who died in or survived the Holocaust. After dinner we went to the TV Tower, one of Berlin's most iconic landmarks. We learned that the tower was originally built by the East German government after they removed all religious imagery including crosses from their side of the city. Unfortunately for them, the TV Tower they built has a huge golden cross on the side of it when the sun shines on it during the day, and despite some expensive measures the tried to take such as using special paint to repaint it, the golden cross remains. We got an elevator to the top of the tower, and I could feel my ears popping as we went up. At the top, we had a chance to look around and admire our view of the city from the tower at night. On the final day we had planned to go to the zoo and Hitler's bunker, but unfortunately our flight had been moved to earlier in the day so we didn't get to see them. I did, unsurprisingly, set off one final security machine as we went through the airport and get my last security search. We flew back to Dublin, exhausted but completely satisfied with our trip. Everybody said that they had the best time and all the 4th years especially said it was a once in a lifetime trip. We all went home delighted and beaming, ready to enjoy the rest of our mid term break. On Monday 23rd October, all of the Transition Years were ushered to the hall for an assembly. But it was not unlike any assembly, we had ever had before. This assembly was focused on highlighting different activities that students took part in during the first term of Transition Year. There were performances from the Sign Language Module, Mandarin and Film Studies classes. The Sign Language class performed 'Stay' by Rihanna. The Mandarin class sang a song and the Film Studies class performed a scene from ‘Annie’. We all really enjoyed the performances and it was a good opportunity to get insight into each module and to see what they had achieved over the term. 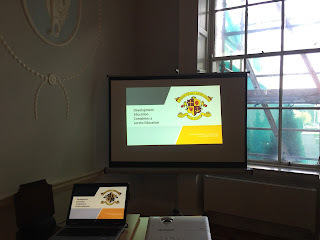 In addition, the Chairpersons of the Fundraising and Photography Committee, representatives of the TY Blog and Student Council spoke and informed us of what they had been working on since September. The assembly ended with a blessing. I think it was a great way to celebrate our achievements so far in the school year and I would definitely love to do something similar to this again. At 8:30am on the morning of Wednesday 25th October, I came into school eager to help with the Cheerios Childline Breakfast Morning. I went into Ms. Ryans kitchen and my jaw dropped when I saw the room filled with food. From cereal to brioche buns to strawberries. I asked the teachers who were unpacking fruit if they needed any help. They asked me to put up posters and bunting around the hall to get people aware. I started sticking them up when a few more girls from the fundraising committee came over to help me. When we finished our task we went back into the kitchen and began putting all the fruit onto trays. At 09:15 all the food was out in the hall, we sat waiting for the hungry first years to rampage the hall. At 09:20 the first years began flooding into the hall. They all took their seats and got their bowls and spoons ready. The teachers then explained that all the food that was sitting before their eyes was given to them for free by all the shops that sponsor Cheerios Childline. The fourth year helpers began to distribute the boxes of cereal and milk. After they finished the cereal we then proceeded to give out a few extras such as fruit, yoghurts and brioche buns. We then went around and collected donations for Childline. The first years finished up their food and the fourth years began to tidy up. We collected all the rubbish and let the first years wash their bowls in the kitchen. After all was cleaned up the first years left the hall. We set up the hall back the way it was and then we began counting the donations, a few minutes later we found out we had raised €352.49. We were all so proud of ourselves and of all the money we had raised for Childine. It was a great day and everyone enjoyed themselves. In the TY Legal Studies Module, one of the main topics and areas that we focused on was the roles played in the context of a court room. We learned about the role of the judge, the tip-staff, the registrar, barristers and solicitors etc. So when we discovered that we would be bringing these roles to life in our very own mock trial, we became very excited and driven to preform to the best of our ability. This mock trial would see us up against the other module class, presenting us with great competition. 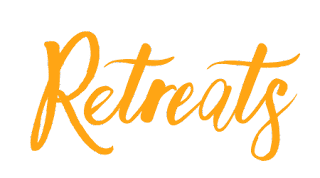 We spent the weeks leading up to the trial preparing and assigning roles to everyone in the class, making sure nobody was left without a job or purpose throughout the course of the trial. We all studied the case and familiarised ourselves with the story we were given. When the day of mock trial came around, both classes arrived in the library to begin arranging the tables and chairs to resemble a court room giving a more professional approach to the setting. We began immediately, with no time to lose. The "judge" came in and the trial commenced. The prosecution and defence gave their opening statements before the prosecution witnesses were called to be questioned. After the prosecution questioned their first witness, the defence then cross examined them. This was repeated for all three of the prosecution witnesses before moving on to the defence witnesses where the prosecution cross examined this time. Each witness had the tough job of preforming as believable as possible while the very talented barristers questioned them. Everyone portrayed their role with a lot of skill and talent and our teachers Ms O'Neill and Mr Daly were impressed and also hopeful with the thought of some future lawyers in the mix. Closing statements were given before the jury were sent out to deliberate. Their verdict was decided swiftly before they arrived back to announce the accused not guilty. We finished up by talking with Mr Daly and Ms O'Neill about the module, what we enjoyed, learned and our thoughts on the mock trial. I found the experience of completing this mock trial highly enjoyable and educational. 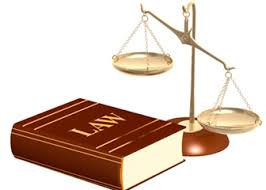 I am very glad that I was assigned legal studies as a module as it has opened my eyes to the world of law, crime and the courts, all things that I have now become very interested in and may even pursue as a career.